← Crafty Halloween idea: Spooktacular Salad! Step 1: Make the most of a countryside walk gathering up dry twigs and sticks from your garden, nearby park or winter stroll in the park. 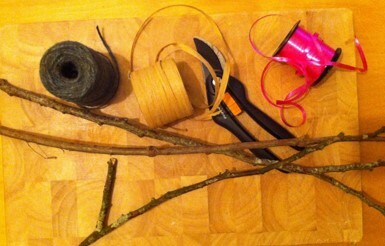 Step 3: Cut the twigs into 6 equal lengths (about 6-10cm long will make it easier to tie the ends together). 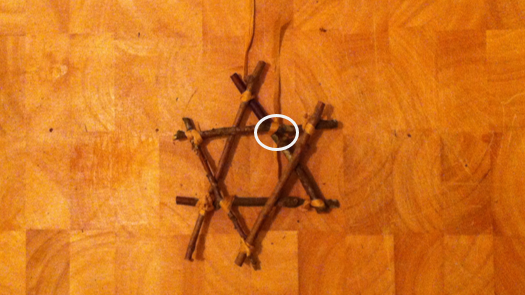 Step 4: Take 2 twigs and cross two ends into a triangle shape. Place the string under the cross and tie a knot. 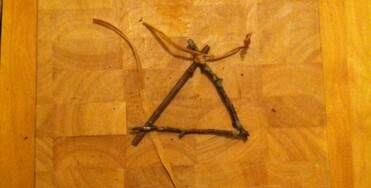 Step 5: Take a third twig and cross it to make a triangle with 3 equal sides. Repeat with the remaining three twigs. Step 6: Place one triangle over the other to make a star shape. Step 7: Take a piece of string and tie the two stars together at the join (see picture above). Repeat at the join opposite. 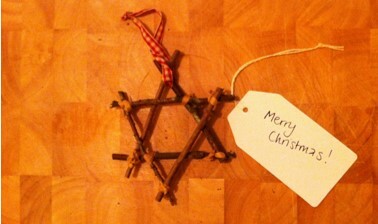 Step 8: Take a piece of string or festive ribbon and make into a tag to hang from your Christmas tree. This entry was posted in Uncategorised and tagged Christmas, crafts, decorations, star. Bookmark the permalink. Oddly enough I found this while looking how to tie together a log raft! Which is actually a similar technique, just on a slightly bigger scale! Thanks for sharing, cool read.